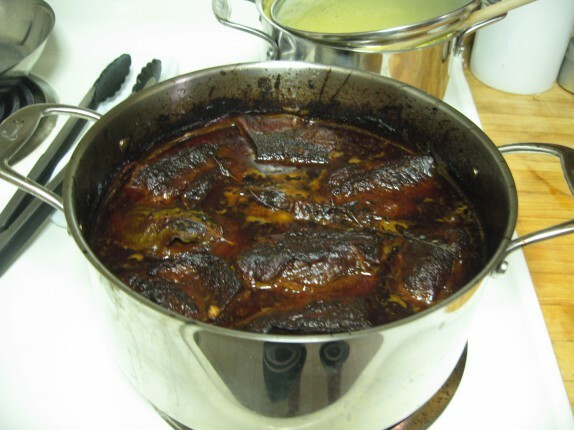 I adapted a recipe from Anne Burrell of Food Network fame. 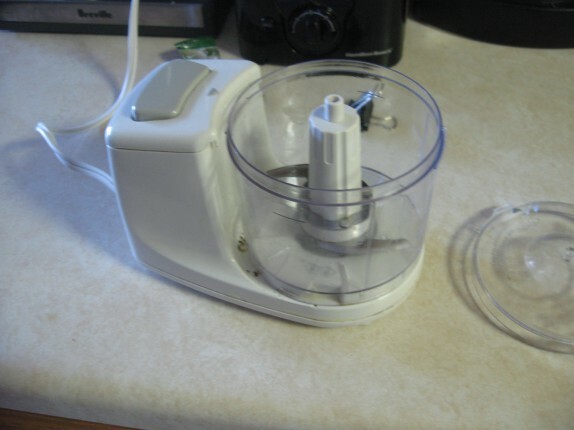 I preheated the oven to 375 degrees and got my trusty miniature food chopper ready to chop the hell out of the aromatics. 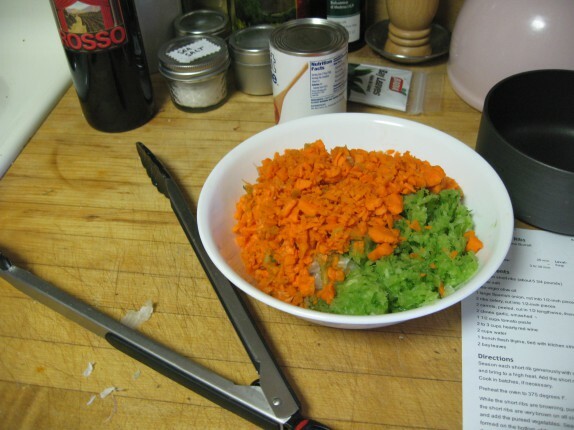 I peeled the onions, carrots, and garlic, and washed the celery, and then used the chopper to get them all into little bits. I started heating my large, oven-safe pot on the stove on medium-high. I added about 2 tablespoons of olive oil and browned the short ribs (that I copiously seasoned with salt and pepper) on all sides. Once all of the ribs were browned, I added the chopped aromatics (with some salt and pepper) to the pot and fried them until all the moisture was gone. 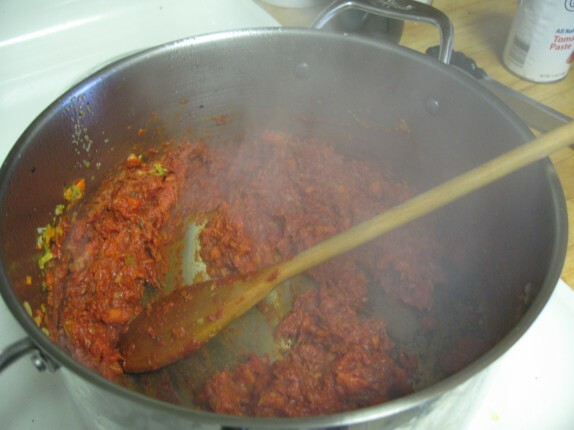 I added the tomato paste (with some salt and pepper), and cooked it for a few more minutes to brown the paste. 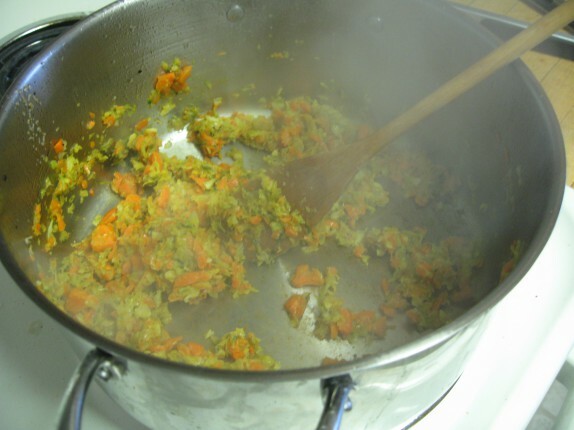 Then I added a few cups of the red wine, and cooked it down until the moisture was gone. It's all about developing flavor. 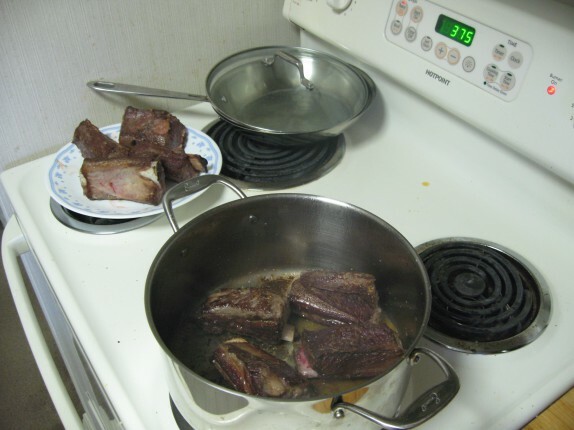 The short ribs all went back into the pot with enough water to barely cover the ribs. I also added the bunch of thyme (which I tied with some string for easy extraction) and a few bay leaves. I covered the pot, and put it in the oven for 3 hours. Everything up to this point could be a little messy. Once I pulled these out of the oven, I allowed the pot to rest while I got to work on fixing up some polenta. 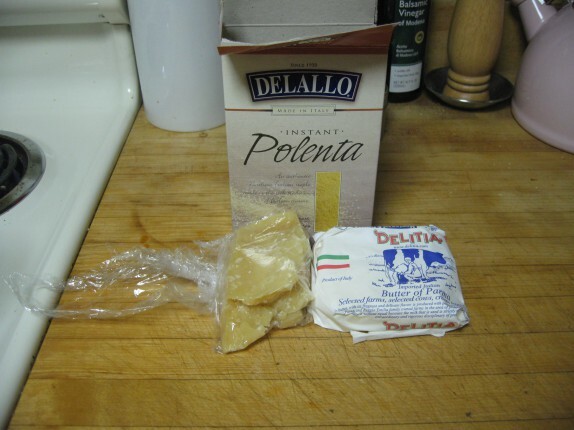 By “fixing up,” I mean, rehydrating a box of instant polenta and doping it with good butter and parmigianno cheese. 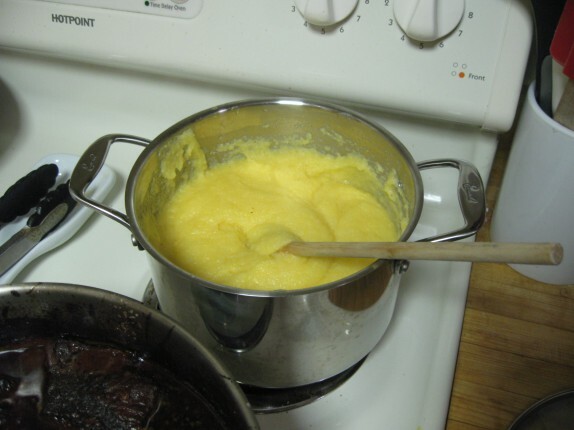 Hey, I checked 6 local markets, and this was the best polenta I could find. 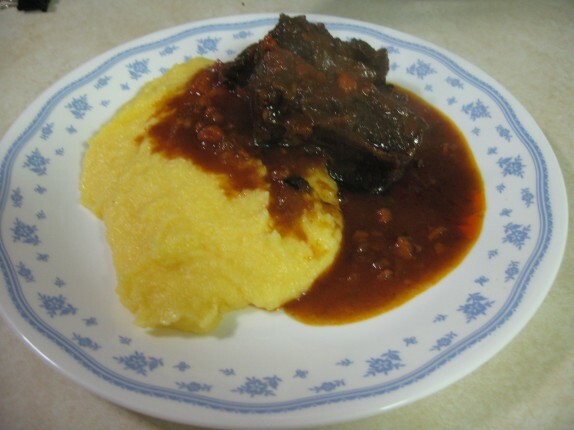 To serve the dish, I simply served the beef, which was now fully tender and had all fallen from the bone, over the polenta with some of the reduced braising liquid. For my first time cooking this cut of beef, I think it came out good. I don’t know that I’d even do anything differently next time. 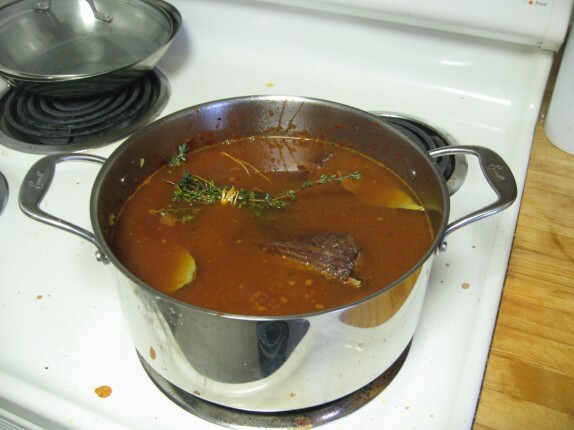 Along with the polenta, the meat and braising liquid had lots of great flavor and texture. It was a nice, hearty meal. That looks awesome. Also, wish I’d caught that sale — I have a short rib recipe I’m itching to try. The Short Ribs are on sale this week! I bet you can find Polenta at Fresh Market or Roma’s. 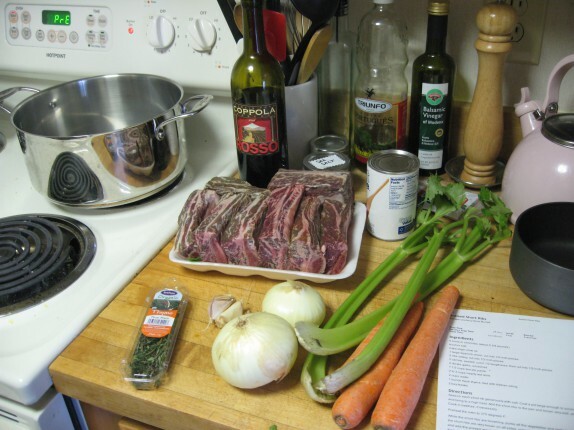 Those short ribs look amazing….I think I might use sodium free beef stock instead of the water to add even another layer of flavor….or perhaps some stout…or combination of…. Roma only had instant, and same with fresh market at the time. Since then, fresh market now has good Polenta but the price is outrageous, something like 8 bucks for 12 oz. Great recipe, I’m definitely going to try it out. Any suggestions for adding a tad heat to it? Maybe a pinch (or 3) of red pepper flakes added to the aromatics? Go for it, buddy! I prefer some heat, but I sometimes tame it down for general consumption. Now that I have your blessing, I’m going for it…I’m going to bring it to my family’s Thanksgiving dinner. Just an FYI: The polenta pretty much needs to be prepared immediately before serving, otherwise it’ll seize up and not be creamy and flowy. If you get instant polenta (like I did), which is not quite as good as slow cooking stuff, but it’s not bad, it takes 5 minutes.